Mitsui is a student of Hikarizaka Private High School. She talked with Fuko for a bit during the school's entrance ceremony before her accident. Though she remembers Fuko, she refuses to accept Fuko's starfish sculpture gift and request to go to her sister's wedding, since she is a senior and is busy with entrance exams. This hurts Fuko's feelings. In The Older and Younger Sister's Founder's Festival, she finally accepts Fuko's gift after seeing that she continued to give them out to people. She then promises to go to Fuko's sister's wedding if it was after her exams. This cheers Fuko up. In The Wind That Vanishes Into Dusk, however, Mitsui, like most people, starts to forget about Fuko. 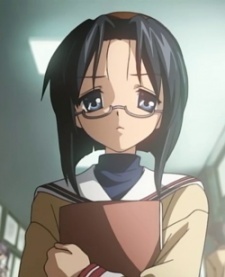 She thinks Tomoya and Nagisa were playing a trick on her when they try to make her remember Fuko. In Until the End of the Dream, she finally remembers Fuko and her sister's wedding, and came to the wedding to celebrate it.